My oldest son and his friends will pack up (lightly), jump on the train and head off and wild camp, they do it now and then, and normally cram into one tent. 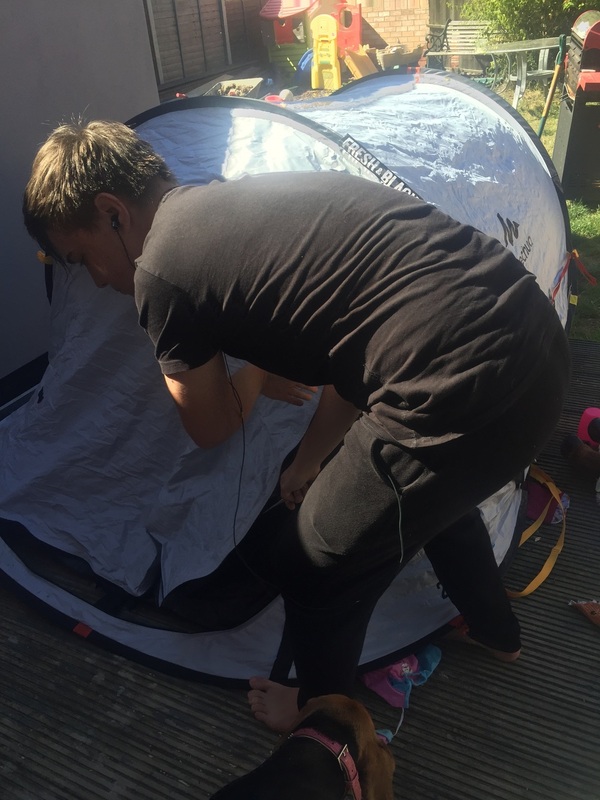 So when we were invited to review the Quechea 2 Seconds Easy II Fresh & Black pop up tent, I knew it would be perfect for my son. The Quechua 2 seconds Easy II Fresh & Black pop up tent allows for plenty of room for two people. The nice low ceiling means it stays warm well and the 'black' fabric of the inner helps block light on those bright early mornings. The outer white reflective skin keeps the inside of the tent cool and 'fresh', with side vents on either side to help cool down the tent. It's a light and airy tent to camp out in. It seems to stands up well to wind and rain, it's a robust and sturdy tent. There's generous space between the inner and outer part, with a small porch in front of the inner tent, which gives added protection from the elements and some extra storage space. It has an attached ground sheet. Inside the tent the quality and innovation continues - there's a small hook where you can hang your light, and there are handy storage pockets on each side - this is where my son stores his clothes. He needs a lightweight, compact, easy to use tent, and the Quechea 2 Seconds Easy II Fresh & Black pop up tent gives him just that. My son is super pleased with his new tent. Ideal for one or two people on short trips, perfect for my teenage son who likes to go on wild camping trips with his friends. RRP price is £59.99 and you can buy one via here. When it arrived, we were super excited to get it out and try the pop up functionality to see how it worked - we were pretty impressed. It's a stunning looking tent. This is a photo my son took whilst they were out camping the other evening. He was super impressed with how easy it was to erect the tent - took a matter of seconds. However, he did say that putting it down wasn't as easy as putting it up, thus, it would take a bit of practice.